Unfortunately this weekend I am sick and I cannot go out with my motorcycle (Honda CBR125R), so I decided to spend some time and write the BOM (Bill of Material) for Fuelino Proto3. Akizukidenshi, for electronic components. This is a shop located in Akihabara (秋葉原), inside Tokyo. FirstPCB, for PCB manufacturing. This is a factory located in China. After sending the Gerber files (made with Eagle), it takes about 1 week to receive the manufactured boards at home. The service is pretty fast, and cheap (10 boards cost 10 dollars, plus 20 dollars for DHL shipment), I am very satisfied. As I explained, the PCB boards cost 3000 Yen (about 30 dollars, 25 Euro) for 10 pieces. Including all other electronic components (through hole mount), I calculated a total price of 921 Yen (about 8 Euro) for each Fuelino Proto3 board. It's pretty cheap right? However, to be honest, in order to have a complete working system, it is also necessary to add a case, connection cables, and so on. In the worst case, I estimated that the price will not be higher than 30 Euro. The Excel file is available at this link: fuelino_proto3_bom. My target is to assemble 5 sample boards, so I made an order at Akizukidenshi (秋月電子): however, since I already had many spare components at home (LM358, FKI10531, ...), I decided to avoid buying some components, to save costs. 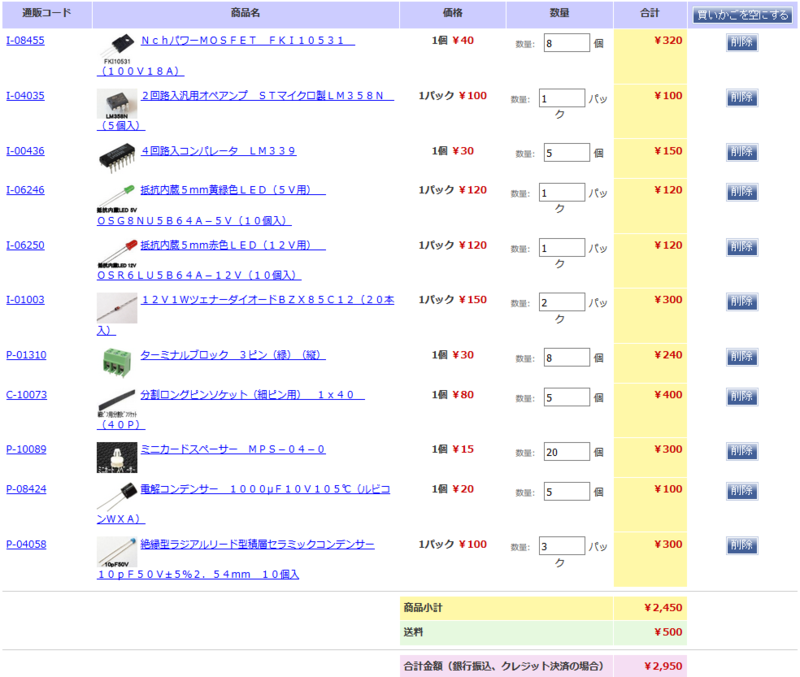 Purchasing components on Akizukidenshi's website is very straight forward. They also have a physical shop in Akihabara, I also went there sometimes during the weekend, but it is very crowded and they have a limited amount of components, so I prefer to purchase via Internet. After receiving the components at home (it will require 2-3 days), I will start to assemble the first Fuelino Proto3 boards, test them on my motorcycle, and post some pictures and videos.